MP3 is the most popular digital audio format for the last 20 years. It's quite a big age for computer technology. Even lossless formats are not a better option in many cases. Lossless compression allows full restoring of original audio signal with no loss in quality - and this is its only advantage. Original quality means big size that implies slow decoding and transferring. In many areas like IP telephony, online media streaming this is unacceptable, even with today's connection speeds. For these needs users prefer lossy codecs that can produce good sound quality. And MP3 for now is the most popular choice in terms of quality and file size. For decades there was no such lossy format that could supersede MP3. However, it has its own shortcomings. These are bad quality of sound on low bitrates, audible noise and big delays during data transmission. These shortcomings were thoroughly studied by Opus codec developers. The team of specialists from Xiph.Org Foundation (Mozilla Corporation) and Skype Technologies S.A. (Microsoft) created a new codec that features all advantages of MP3 and minimizes its shortcomings called Opus. Opus is a hybrid of CELT and SILK codecs. Audio signal is coded selectively by both these codecs. SILK engine is used for efficient voice compression. Voice signals are separated from the rest of audio data and compressed. Then Opus analyzes data for noise, disturbance and other unwanted deformations, in order to define the optimal bitrate. After this signals are processed by sound cleaning filter. Then a frequency predicting module is applied in order to choose optimal frequency for overall voice sounding. If selected bitrate is not high enough, there can be unwanted distortion. SILK removes such distortion, lowers noises by moving them out of operational range. After all processing procedures are finished, SILK outputs the ready-made audio signal. In such a way OPUS processes mostly voice signals for IP telephony and other services, where high-quality voice compression is required. For coding high-quality audio files (music) Opus applies CELT compression. It acts as major part of lossy compression algorithms based on discrete cosine transformation and sound optimization. The optimization itself implies deleting those signal components that do not carry any important information. Human ear can hardly catch these minor components. As a result music files get high quality within compact size. Opus has a few compression modes to choose from. Depending on the type of file (music, voice record, etc. ), Opus defines the priority of using this or that coding algorithm. The supported samplerate is 8 - 48 kHz, bitrate 6 - 510 kbps. Mono and stereo coding is possible, constant and variable bitrate, as well as compression up to 255 channels. 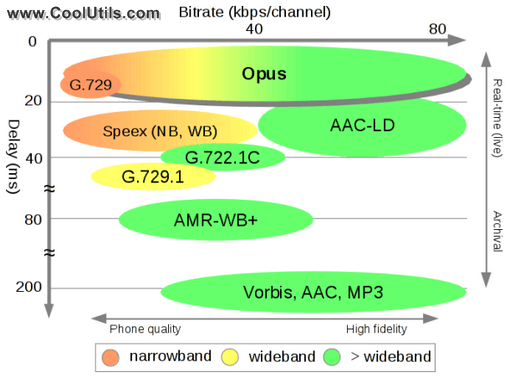 Compared with other lossy formats like AAC, MP3, Vorbis, Opus provides shorter delay in transmitting data via different channels. Sound quality tests also show that Opus is more efficient in terms of restoring the initial sound on different bitrates and samplerates. It provides stable work in different conditions, and seems Opus is a format of future for various telecom services. This codec is adaptive to the type of sound information, it can partially compensate losses in quality during transmission providing stable live data transfer without any breaks. Being a new format, Opus is growing in popularity very fast, but there is still problem with support by different user applications. Chances are high that your favorite player doesn't play Opus files. Total Audio Converter helps to solve this problem by converting Opus to MP3, AAC and other formats.